Elizabeth Vega teaches pre-kindergarten at Loma Verde Elementary in Novato, California. Her school and district leaders want to do more project-based learning and have invested in getting teachers like Vega some training. That means she took one workshop on project-based learning, got excited about the possibilities, and then was sent back to her classroom to try it out. “It sounded all great when they talked us through it,” Vega said, but when she got back to her classroom, and only had her notes for pointers, the whole endeavor became overwhelming. That didn’t stop Vega from trying, but the first project she and her team teachers implemented didn’t go at all how they’d planned. The team noticed the school’s garden was dying and they thought it would be neat for students to design a new watering system. But the kids didn’t care about the project at all. They just said, “use the hose.” Vega wasn’t entirely sure they even fully understood the problem, but she could tell they weren’t engaged in solving it, so her team ended up dropping the project. “I think it was eye-opening for us,” Vega said. It was a clear example of why students need a voice in the design process, something Vega remembers from her training, but that somehow got glossed over when the teachers sat down to plan. “We need to have that conversation with our students first and ask them what problems we’re having at Loma Verde. That way they have voice in that process,” Vega said. This first hiccup hasn’t deterred Vega. When she’s had success she can clearly see students are engaged with projects. She does wish she had more support as a way to check the things she’s trying against best practices. She’d really like to have a project-based learning coach, but if she can’t have that, she’d like tools to help her reflect on how to improve. There are a lot of teachers in the same position as Vega. 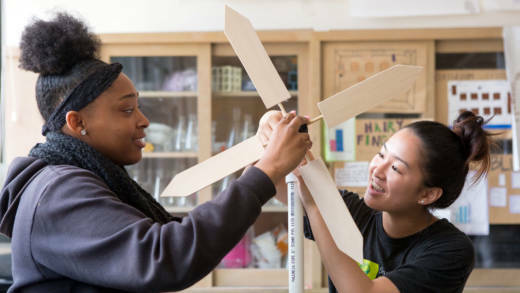 Interest in project-based learning has exploded, and the practice can now be found in some form or another all over the United States. But while interest in projects is high, a deep understanding of what makes project work meaningful and impactful to students is less ubiquitous. “People are calling a lot of things project-based learning that aren’t necessarily high quality learning experiences for kids,” said Bob Lenz, executive director of the Buck Institute for Education. That’s a concern for many educators, like Lenz, who have worked on project-based learning for decades and know there’s danger in an education trend that goes wild, but isn’t implemented well. To write this document, a core group of educators who have taught with projects for a long time wrote a draft and got feedback from the convened stakeholders. They made revisions and then put the new draft out for public comment. They got a few thousand comments within the U.S. and globally, which they used to revise once again. The third iteration went back to the steering committee for final sign-off and touch-ups. “It wasn’t too hard to find consensus, but some of the challenge was, ‘are we describing what teachers are doing or are we describing what kids are doing?’” Lenz said. Ultimately, the steering group decided that there are plenty of existing materials focused on teachers, but few that describe what student learning looked like in a high quality project-based learning environment. Lenz hopes that by focusing on students, parents can also use the framework to hold schools accountable. 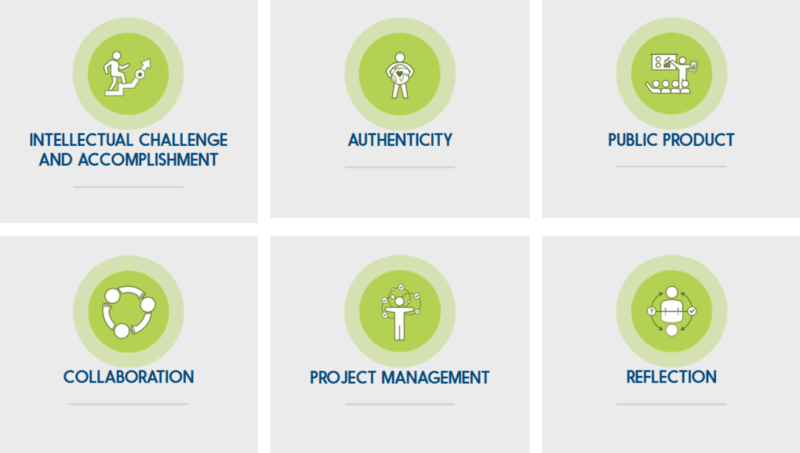 The framework is built around six basic elements that the framers believe must be present: intellectual challenge and accomplishment, authenticity, public product, collaboration, project management and reflection. “One of the most common things that's missing from what people call projects is that it’s not intellectually challenging,” Lenz said. He acknowledges that progressive educators often criticize the Buck Institute for coaching teachers that projects should be standards-based, but Lenz said that's one way to make sure the projects aren't disconnected from content. The Mission Project -- which until recently was common for fourth graders in California schools -- is a good example of "project" that doesn't hold up under this framework. Usually students learn a lot of history about how the missions in California came to be, and then as an afterthought they build a model mission. The “project” part could be completed by a parent or bought off the shelf. It has very little connection to the learning. This is what some educators call a “dessert project” -- it comes after the learning. And according to the new framework, it’s not really project-based learning. “The big ah-ha for a lot of teachers in our workshops is that projects can be about academic content,” Lenz said. “It’s often seen as something after kids have learned their academic content.” But there are other misconceptions as well. “A lot of new models are oriented, and have as part of their espoused design, that they want to use personalized learning and skill-based work so kids can do project-based learning,” Lenz said. He’s describing a strain of the “personalized learning” movement that uses online playlists to move students through content, but also tries to blend projects in as demonstrations of learning. “I don’t think they’re very clear on what makes high quality PBL,” Lenz said. That’s where the authenticity and public product standards come into play. If the project doesn’t mirror the ways people work in the real world then it isn’t authentic, according to Lenz. “When PBL is done really well the context engages kids and then teachers can apply the same strategies they might have used out of context to kids who are a little more engaged,” Lenz said. He emphasized that teachers have to give students structure and support to get good outcomes, especially when students haven’t experienced projects before. “The process is what it should be all about,” Lenz said. But in order to move beyond content, teachers have to be clear about teaching skills like setting goals and making action plans, and then teachers have to assess those skills as they would content. As with anything else in the classroom, project-based learning teachers can’t assume kids already have the skills. Telannia Norfar teaches high school math at Northwest Classen High School in Oklahoma City -- where she was also a student. She’s had a few careers before teaching, but since she entered the classroom 11 years ago she’s been using project-based learning. Norfar is on the steering committee that worked to create the High Quality Project Based Learning Framework. “With so many practitioners who have been in the project world -- and did it even when it wasn’t popular in education -- for all of them to come together and come up with common language will be really helpful,” Norfar said. Norfar’s district isn’t big on project-based learning and for a long time she didn’t have any colleagues who were interested in collaborating with her. But she has continued to use projects to teach the most important math concepts, the ones she really wants students to nail, for one simple reason -- she says it works. Norfar doesn’t want to simplify the many important pieces of quality projects, but she also doesn’t want interested teachers to feel so overwhelmed they never start trying. She finds a lot of her math projects by talking to people outside of education. In social situations, on airplanes, at networking events for other professions, she asks professionals how they actually use math in their work. She builds projects from there. “You can start with your friends, especially if you didn’t come from a family where everybody is a teacher,” Norfar said. Many math teachers, she said, haven’t used math in a profession; they were just good math students. To help students see relevance in math, and to empower them to make a difference with the knowledge they are gaining, Norfar wants them to use math in authentic ways. Norfar has done financial planning projects, architectural design projects, aerospace engineering projects (inspired by a conversation about matrices with an engineer on a plane), and she’s currently exploring a chemistry related project with a professor friend. Norfar says every year it’s the projects that change students’ minds about their future in mathematics. She remembers one student in a pre-AP class who was struggling. As a class they worked on a project to design a new house for a family that was outgrowing theirs. The student’s father worked in construction, and he helped her draw plans that were blueprint quality. “And it inspired her to become an architect,” Norfar said. One misperception Norfar sees among many colleagues who are skeptical of project-based learning is the belief that everything has to fit into a project. Norfar says she only spends time on projects for the standards that are most important. To decide, she used the book “Power Standards” to get at the heart of her content standards. She breaks out the six most important units and spends a month on each of them. “It looks like we’re covering a lot, but even inside of it we intentionally said we really need to introduce this to help them understand, but it’s not the diehard thing,” Norfar said. She’s finally got an algebra teaching team interested in collaborating and it is intentionally spiraling back to the idea of the line, what it is and what it isn’t, because it’s a foundational algebraic idea. Norfar admits that it has been a long journey to get to a place where she’s comfortable owning her content in this way; and she’s still improving. Right now, her focus is on improving how she works reflection into her classes. She says teaching with high quality projects means always believing you can improve. “I would never say I’ve got this down. That’s not possible. There’s always room to grow,” Norfar said. She’s surprised sometimes about how resistant her colleagues are to change. “I'm like, ‘the world changes, you have to change too,’ “ she said. That’s why as much as Norfar wants all projects to involve all six of the elements set out in the framework, on a practical level she just wants people to try something new. And she’s worried that unless the value of project-based learning is assessed with more than just tests many educators will abandon it. “I’m so concerned that we will be the next fad for education,” Norfar said. “I'll be honest, I have some of the same test scores as the teacher next to me who does not do PBL.” But she doesn’t think the tests reveal the ways students are growing as people and thinkers when they’re engaged in projects. She wishes there were other metrics for the type of growth she sees. “My students are so much more prepared once they leave high school than the teacher next door who got the test results, but his kids don't know how to work together,” she said.